With the current advancement in technology, it’s imperative that small businesses have a comprehensive and emphasized Internet marketing strategy. While having a well-optimized website is an essential way to sell your brand, the current competitive business environment demands that small businesses go further. Consisted blogging is one effective way to build your drive traffic, build awareness of your brand, and attract more prospective customers. As the Internet matures, so does the technology behind displaying content and the behavior of your customers. Online customers are engaged, knowledgeable, and picky when it comes to the content they consume. The same is for search engines, and if you want your business to gain a competitive advantage then you need to produce amazing content for your blog. 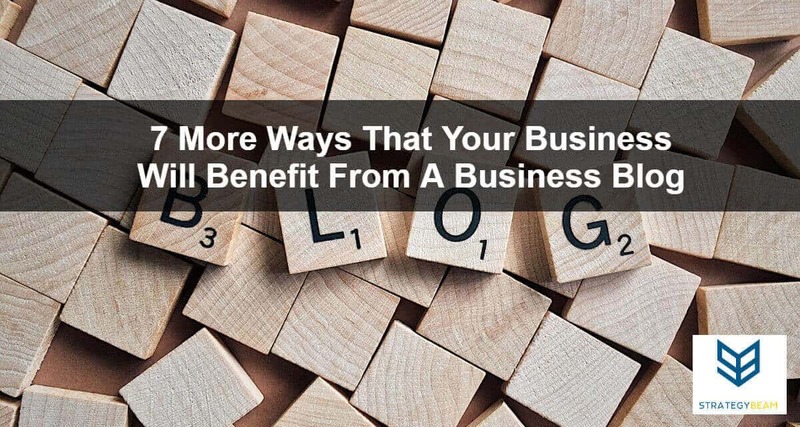 Let’s take a look at the top seven ways that your business will benefit from a business blog today! To succeed in online marketing and branding, customer engagement is not an option. Blogging is an inexpensive way of connecting with your existing customers, new customers, and potential customers. With a Freelance Copywriting Services, you can provide relevant content to your target audience thus building trust with them. Since most of the blogs have a comment section, visitors to your blog will be able to comment on the posts, and you will be able to respond to their comments. This will build trust and relationship with them. If you choose to write your own content, then you should consider using online marketing tools for small business to help you achieve your goals without having to spend a lot of money on expensive tools. Adding fresh content to your blog will also boost your SEO strategy as search engines tend to value fresh content more than old content. This means the more articles you post on your blog; the more your website will rank high search engines. Everyone knows how social media is a powerful platform for promoting your website. If you are a small business owner, it’s important that you have a social media presence. However, it may be challenging and time-consuming to get interesting and new content to keep on sharing on your social media page especially when you don’t have a dedicated social media employee. But you don’t have to worry about this anymore as blogging can provide you with fresh and valuable content that you can keep on sharing with your followers. By sharing your published blog posts on your social media page, you could also attract new audiences to your website. After all, your existing customers won’t need to follow you on social media as they already know your business. This makes social media a good strategy to tap new prospective customers. You can agree with me that in every business, it’s all about leads. All these fresh content you are publishing on your blog goes a long way in converting traffic into leads. Blogging is not just a great way to drive traffic to your site, but by setting up proper tracking you can begin to qualify leads using content on your business blog. The customer journey is a term used for leading customers to your content to answer their questions and purchase from you. This process is not easy, but with a blog you can develop content to address specific needs. As you track readership, Time On Page, and other metrics, you can see what content is driving the most traffic and test ways to convert that audience. There is also another way to generate leads to your site. In every blog post, you can include a Call to Action in the last paragraph. This is a strategy used by almost everyone nowadays, and it works. Additionally, you can also provide other links with related content at end or middle of the posts. If the reader is interested in your post, he or she will click that link to see more compelling content. In the end, the readers will be converted into leads. No matter how small your business is, having a professional business blog is a fantastic way to develop clout in your industry and build trust by providing fresh content that your audience or readers will view it as an expert and valuable information. Since your market is competitive, you need to do everything that you can to differentiate your business. Your business blog is a great place to share your knowledge about different aspects of your industry and help your customers know that you understand their problems and offer the solution they are looking for. Your business website is often a central place to talk about your products and services. While this is a vital piece to push sales, your business also needs a place to build rapport and develop relationships that will drive people to trust your products and services. Your business blog will be a key piece of your overall strategy to establish yourself as an industry leader because you can share stories, insights, and progress reports to help your readers see that you are the best solution to their problems. By posting regular articles on your blog that are informative or helpful can make you a “go to” resource in that particular niche or industry. This will subsequently increase conversion rates and leads. Don’t confuse this point with the above point about sharing on social media. By maintaining a business blog, you will provide an opportunity for people to share links to your blog with their friends. Word of mouth marketing is a great way to boost qualified traffic and drive sales, and business blogging is central to creating this process for you. Amazing content on your business blog will create viral traffic to your site and rapid market growth. With the various sharing platforms, your visitors can share it the direct link to your blog, email it, or tweet it to their friends. Once you understand who your ideal customers are, you should begin creating content on your business blog for them. By doing this you will begin to build a content library to help increase your online rankings, while at the same time, you will be developing information that your customers can share with their friends, co-workers, and acquaintances. When your clients or prospects comment on your blog or social media about your post, you can get insight into their thinking. They may react to your customer service, sales process or give suggestions for product or service improvement. You should then reply to their comments. Blogging is a great opportunity for you to speak to your customers and prospects in a friendly and approachable tone. While your main pages can come off as salesy, your blog is a time for you to expand on your knowledge and leadership while also building personal relationships. Show that you and your business are lead by people just like your customers, and use this approach to build a brand of relationships. This aspect of online marketing is often overlooked, but your business blog will help you establish a strong online presence that will build a dependable user base. By engaging with your customers on a public forum and addressing their concerns, it will show that you sincerely care about them. This will add credibility to your business and thus bring more new customers. If you want an excellent and inexpensive way of increasing your online exposure why building yourself as an expert in your particular industry, then you should take advantage of blogging. Blogging is a must for small businesses and should not be overlooked if they need to succeed in this competitive online marketing environment. If you do not have expertise, resources or time to write blog posts, you can always get them from a reputable digital agency that can craft relevant, unique, and engaging content for your blog site. Take 30 seconds to fill out the form below if you want to grow your business today!